I should investigate. Back in the UK, I attended a weekend course run by the late Bob Ridges, and absorbed whatever information I could. 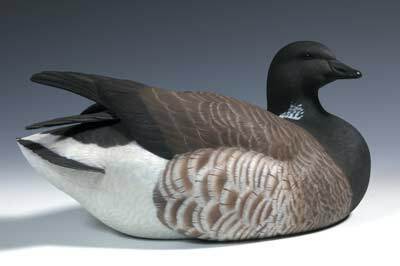 My first carving, a simple tufted duck, won a Best First Duck award from the late Sir Peter Scott, who encouraged me to continue in three-dimensions. 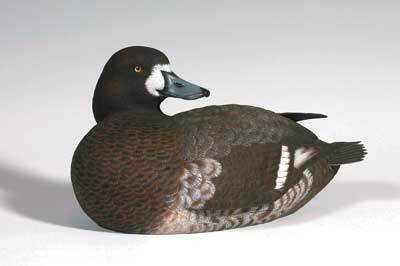 I then discovered the World Championships for Wildfowl artists in Maryland USA, of which I have attended every year since. For me it was like being a kid in a sweetie shop, with world-famous sculptors who were willing to give me their time. I have now competed and attended the 'worlds' for the last 20 years, and I still learn something every time I go. The late Sir Peter Scott encouraged me to move from flat art into three-dimensional forms, something I've continued with ever since. 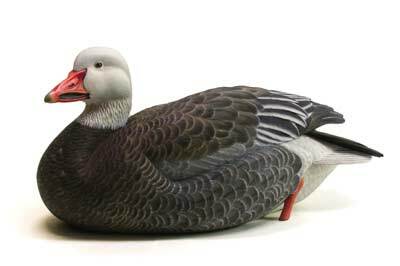 What do you find inspires you when you carve? The inspiration for my sculptures can come from anywhere. Inspiration is all around us. It's whatever captures your imagination at any one time. 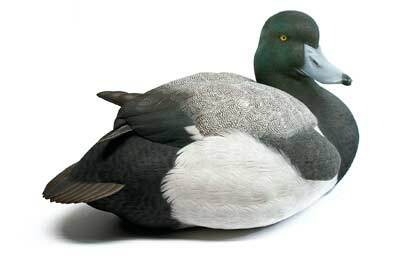 At the moment I'm working on sculptures of ten of the world's most endangered species, and also finishing a pair of Greater Scaup for this year's Ward World Championships. As I prefer to sculpt my work, I couldn't live without my carving knives. The handles are made to fit my hands, and the blades are shaped for various stages of carving, from heavy removal to fine detail. My biggest achievement to date was winning a first place at Masters level at last year's world championships. 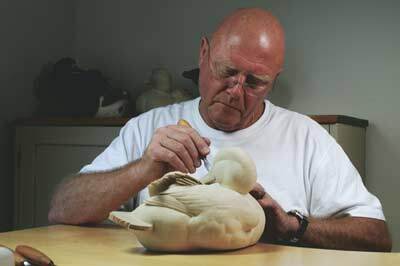 The sculptor I most admire is Jett Brunet, a Cajun from Louisiana USA. If I wasn't a sculptor I would revert back to being a fine artist - that's were I started with a fine arts' degree. Describe the view from your bench and where you live. The view from my workbench overlooks my garden, but I rarely get time to look out of the window. Inside my studio you would find walls covered in every piece of reference material imaginable, my patterns, mounted specimens, photographs, books, and half finished work. My method of working is to totally understand each subject, from how it moves to how it floats. I usually have Radio 5 Live on in my studio, but it's background noise - apart from any arguments I may have with the radio if there is a particular debate I find irritating! I always carve for myself. I only produce sculptures of what I want to make, which is the resaon why I don't accept commissions. I'm very self-critical of my work. When I've finished a piece, I can normally find an area I would treat differently next time. Our art form is continually evolving. I always try for perfection but know it's never achievable. You can always improve on what you did last time.